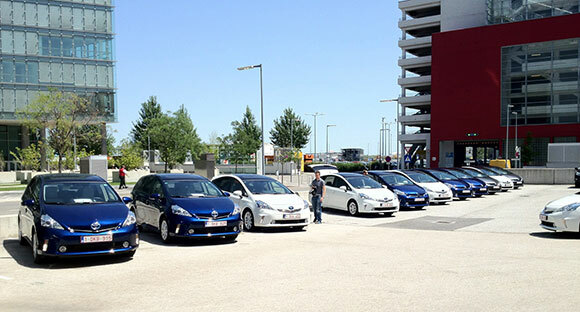 This week, we are helping to launch the Toyota Prius+, the newest and largest addition to the Prius hybrid family. 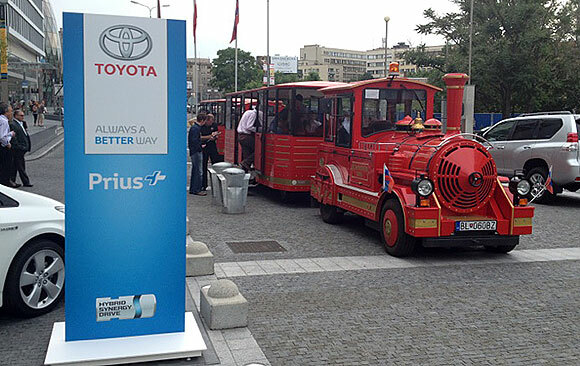 The car makes its debut in the Slovakian capital Bratislava, but we began our journey by flying into Vienna, just 40 miles away over the Austrian border. Our day started early in the morning at Heathrow airport, where 35 of the UK’s top motoring journalists and photographers meet before the flight. We soon arrive in Vienna, and step into 30-degree heat. The contrast to the current British weather goes down well – but it will be an interesting test for the car’s air-conditioning system. 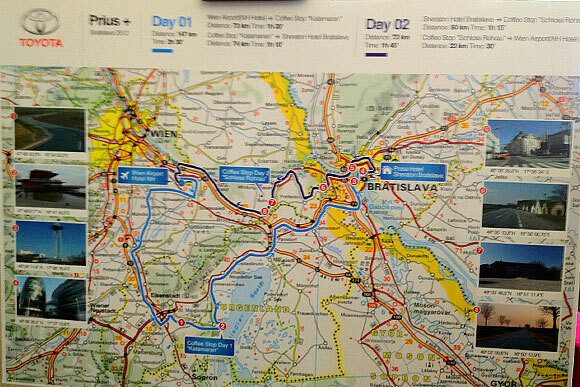 We then head over to a nearby hotel, and take a look at the map of the test route. Keys to cars are distributed among the journalists, who pair up for the test drive. I’m driving with Toyota’s PR boss Scott Brownlee (who our Twitter followers may know as @ToyotaPR). We watch the assembled Prius+ roll silently out of the car park, then get into the white T Spirit model that’s ours for the day. After winding our way out of the office-and-hotel district that surrounds Vienna airport, we’re soon on the open road. I’m first behind the wheel and my initial impression is that while the seating position is fairly high, the Prius+ doesn’t feel as nearly large as some other MPVs. It’s really quiet and very easy to drive. We’ve agreed to help out Pete Gibson, Auto Express magazine’s photographer, get some driving shots of the car so we find a quiet road and drive alongside while he takes images. A couple of passes up and down the road and he’s done. Next, we make our way to a huge inland lake. 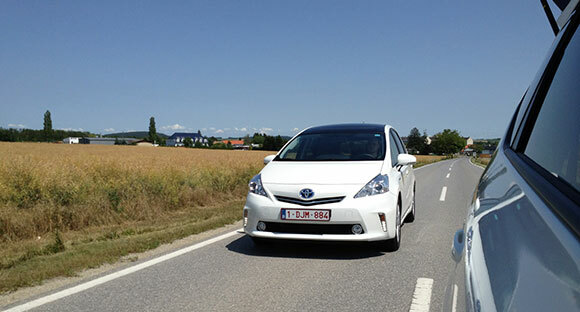 Our route there takes in a mix of country roads and small towns, and the Prius+ makes easy work of the drive. A short stop and we’re soon on the A6 Autobahn and heading for Slovakia. 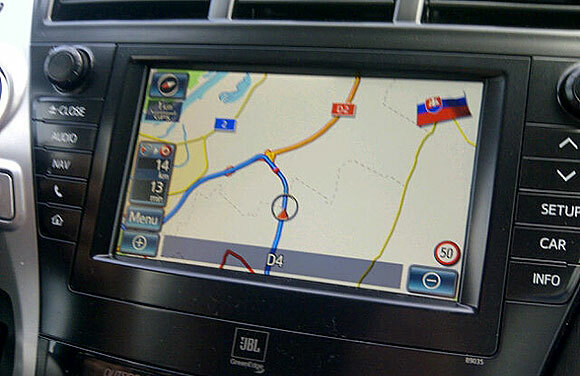 The Touch & Go Plus sat-nav helpfully tells us we’ve crossed the border by displaying a Slovakian flag on the screen. 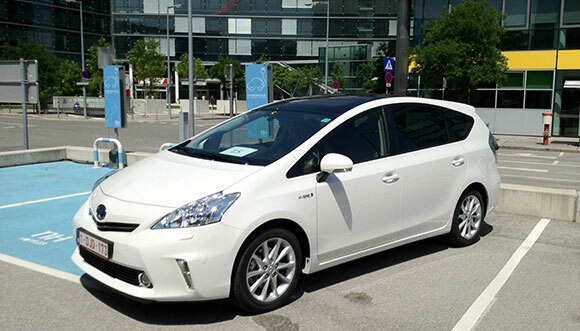 Toyota GB’s managing director Jon Williams reveals that the fuel consumption of all the cars was recorded. 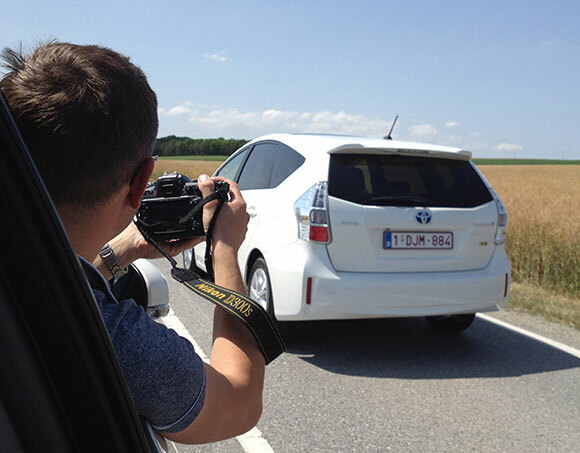 The average for the day is 5.6 litres per 100km, or 50.4mpg – not bad for a bunch of heavy-footed motoring journalists determined to put the Prius+ through its paces. Luckily we slightly bettered that figure – we hit 52.3mpg – but we couldn’t match the 61.4mpg average that two cars achieved. After the press conference, we return to the hotel to grab some dinner and spend a few minutes speaking with the chief engineer of the Prius+, Makoto Okabe. He spent years working on the car, and says his biggest achievement was managing to fit space for seven adults into a relatively compact package, while retaining the economy of the five-seat Prius. 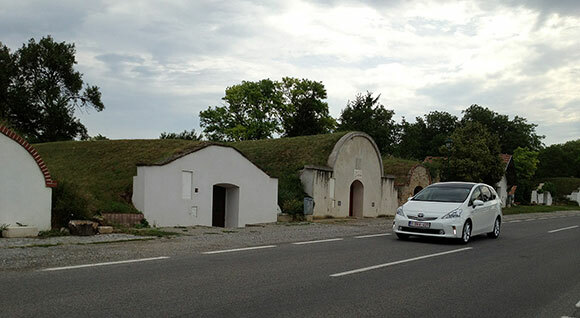 The next day, we take a look at the car’s bootspace and head off for the airport. Our route takes us past some very hobbit-like houses. After a day driving the Prius+, our impression is that it does offer something new to the seven-seat MPV market. It should prove far cheaper to run than diesel-engined rivals, and it’s incredibly easy to drive. It will arrive on UK roads in the July. We will publish more about the Prius+ over the next few days, including a round up of reviews and an interview with the car’s chief engineer, so stay tuned for more.